One Year Anniversary of This Blog! It is with delayed realization that exactly one week ago marked the one-year anniversary of this blog’s existence! It must have been my being caught up in the excitement of Star Wars Celebration that I totally forgot to celebrate my blog’s first birthday, but the excitement of Star Wars Celebration is something that is surely excusable to cause one to forget about other things. Initially, my blogging about Star Wars began with the creation of my site DrewsViews.info, where I posted daily content, with Wednesdays featuring Star Wars material (“Star Wars Wednesdays”). I then began to realize that my Star Wars material needed to be featured as somewhat standalone at the very least. So, I created a twitter account and created a domain name, StarWarsMaven.info, which forwarded to all of the Star Wars content at DrewsViews.info. However, I then realized that just as I enjoyed reading other Star Wars websites and blogs that featured exclusively Star Wars-related content, I, too, ought to do the same thing. So, on 20 April 2014, I created this standalone website, StarWarsMaven.info! I have enjoyed posting content relating to Star Wars, almost entirely related to either movies or television shows, although I have also dipped into writing about Star Wars comics, as well. While I plan on continue on focussing on television and movies, I have enjoyed being exposed to Star Wars comics and look forward to hopefully reading more and writing more about them. Of course, a particular focus within my writing has been “Star Wars: The Clone Wars”, as well as “Star Wars: Clone Wars”. A couple of projects about which I have been writing and hope to soon complete are looking at the characters of Boba Fett and Darth Maul, and may think about other such characters. One project that I have only worked on a little bit and upon which I hope to spend my time has been to write about “Star Wars: The Clone Wars”. Also, while I have not gotten any benefits out of writing on this blog – neither any advertising money, nor products to review, nor any press passes (although I really should start applying for various opportunities*) – I have not intended to it for such purposes (it is a hobby, after all), however, it would be nice to get some remuneration…. 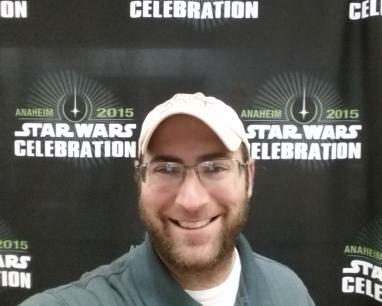 Finally, I look forward to continuing to write here, not only because I have a lot about Star Wars I plan on writing (although my struggle is finding the time, between my job, my family, my life, and, of course, my primary blog), but also because it was great meeting other Star Wars bloggers at Star Wars Celebration last weekend. Also, I received a great boost of confidence/encouragement from having been referenced on another Star Wars blog from Star Wars Celebration! That is one hope of mine going forward: to become involved in the larger Star Wars discourse taking place and, hopefully, being quoted, referenced, etc. * Yes, I should have tried applying for Star Wars Celebration (folks with media credentials got nice treatment), although I could have also applied for a press pass immediately following Celebration for the Angels’ Star Wars night. Oh well, now that I have written this, I realize I should just start applying for press passes, where appropriate.